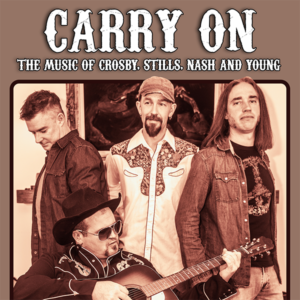 Carry On: A Tribute to Crosby, Stills, Nash and Young is a four-piece outfit made up by Ryan Brohman, Craig McNair, Jason Carraro and Jesse Webber. Born out of the “Woodstock Music Festival” in the summer of 1969, in New York, Crosby, Stills and Nash hit the stage and changed the face of folk/ rock music forever. Through 4 decades, the group, with the addition of Neil Young, crafted beautifully composed harmonies, and stunning lyrical songs that carried a generation. 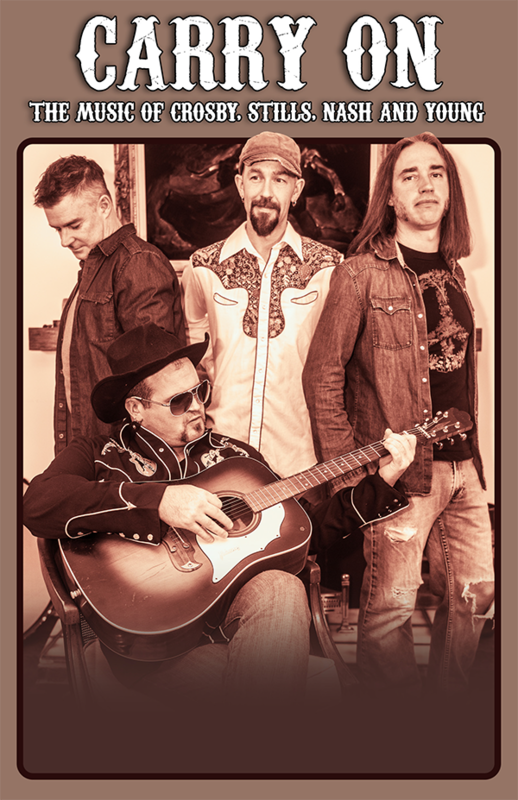 Step back in time, as All four musicians reprise with exacting standards, the love and passion for the complex, harmonious vocal arrangements contrived by Crosby, Stills, Nash and Young. From “Suite Judy Blue Eyes”, “Carry On”, “Deja Vu”, or “Long May You Run”, this musical production show will leave you wanting more. We look forward to seeing you out at one of our shows as we transport you back through the CSNY song book.